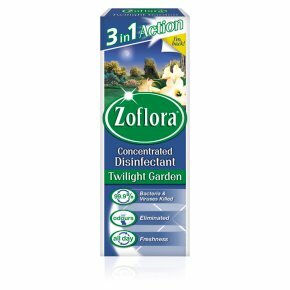 CAUTION<br>Zoflora contains amongst other ingredients: benzalkonium chloride, concentrated perfume compound. Contains citronellol, benzyl salicylate, butylphenyl methylpropional, hexyl cinnamaldehyde, amyl cinnamaldehyde. May produce an allergic reaction. Highly flammable liquid and vapour. Causes serious eye irritation. Causes skin irritation. Harmful to aquatic life with long lasting effects. Keep away from heat, hot surfaces, sparks, open flames and other ignition sources. No smoking. Wear protective gloves/eye protection.<br>IF IN EYES: Rinse continuously with water for several minutes. Remove contact lenses if present and easy to do - continue rinsing. Get medical advice/attention. If medical advice is needed, have product container or label at hand. Dispose of contents by pouring down drain with plenty of water. Empty containers can be disposed of by recycling where possible. Contact your local council for details.<br>KEEP OUT OF REACH OF CHILDREN.<br><br>Precautions<br>TAKE CARE TO AVOID SPILLAGE. If splashed in the eyes or on the skin, wash well with water.<br>DO NOT allow contact with polished wood.<br>DO NOT mix with other chemicals.<br>Wash hands after use.<br>Keep carton for full instructions.<br>For best effect, remove heavy soiling first.